Retro and vintage are in. Big buzzwords I think we're all getting sick of hearing. Even though most of us were embracing the past and its charm well before this movement, the trendy throwbacks have now taken over pop culture. Everyone is high on nostalgia. That includes TMNT too. Digging up Christmas memorabilia from the yesteryear is a blast, but now you don't have to go scouring eBay or digging around dirty flea markets to discover old school treasures. 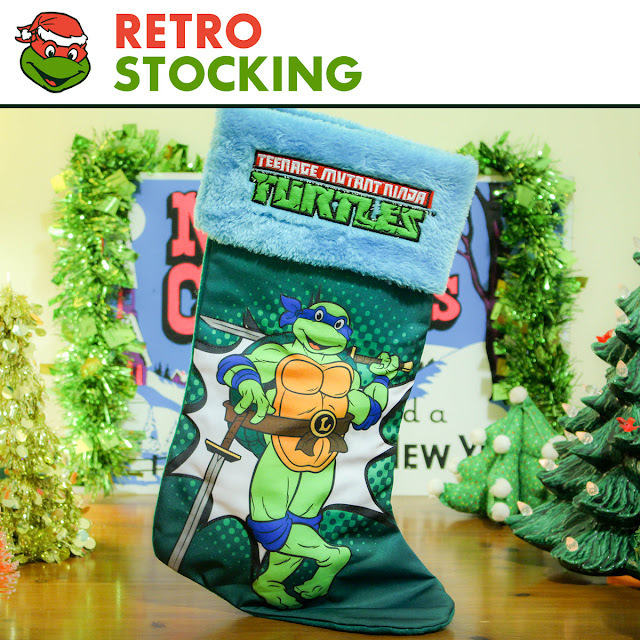 A quick visit to a big box store and you'll find retro-inspired TMNT Christmas gear everywhere, like this stocking featuring Leonardo. The stocking is a mutant. Much like an uncle after too many eggnogs, so many of its attributes are slightly off. It's bigger than any stocking I had growing up. You could slip it onto the foot of Super Shredder. The artwork also features an 80s/90s-style of Leonardo, but the bulky logo above him is from the 2012 Nickelodeon series. Mixup or intentional holiday hijinks? Does a massive, retro-fueled Leonardo stocking deserve to hang from your mantle this Christmas? It's mutant-like attributes are its charm. The combo of size and obscurity really does define the holiday season. Fruitcake, decorated trees indoors, a red-nosed reindeer - Christmas embraces oddities. 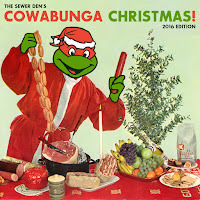 Let's toss the big, clawing-at-nostalgia TMNT stocking into our pile of festive favorites. A big THANK YOU to my pal Chad, aka HorrorMovieBBQ, who played the role of Santa and brought this stocking to The Sewer Den. I didn't even put out cookies! Check out his site and give the jolly man a follow on Twitter! Maybe you'll get a mutant stocking...or not.